The UK’s public finances have improved but only after the introduction of major austerity measures, most of which have impacted the poorest in Britain. The deficit in the nation’s day-to-day budget was eliminated as Osborne had planned it to be, albeit two years too late to meet his target. The former Prime Minister and Osborne’s friend, David Cameron, also tweeted his support. The public services include prisons, which are severely understaffed and where prisoners order drugs to their cells. They include local authorities, where services like day centre transport for isolated, vulnerable adults have been cut and day centres for the disabled have been reduced or closed. Twitter users, many of whom evidently supported Labour, gladly reminded Osborne about the effects his policies have had. Many referred to a shocking study that accused the government of being responsible for thousands of deaths. Austerity was always a political project – look at these two gloating. I’m sure your gratitude will be posthumously appreciated by those who died as a result of your policies. “National effort” implies a choice, of which there was none. George it’s a shame vulnerable people were made to pay for your friends in the city wrecking the economy. I notice you chose to leave the billions stashed offshore by the people that fund your party alone. 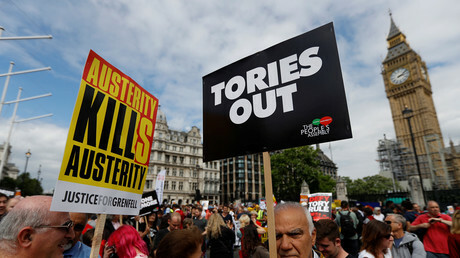 A shocking study published in the British Medical Journal estimates that between 2010 and 2017 some 120,000 lives were cut short due to the austerity measures introduced by the Conservatives, first in coalition with the Liberal Democrats and then alone. The researchers from University College London, Oxford and Cambridge universities, found that mortality rates in the UK had declined steadily from 2001 to 2010, but this reversed sharply and the death rate grew again after austerity came in. The study accused Tories of “economic murder” and said a reversal to pre-2010 levels would cost £25.3 billion.